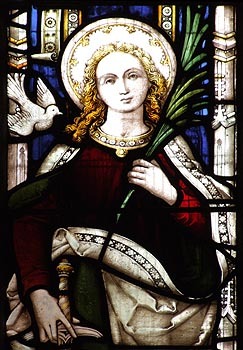 St. Columba was the Cornish St. Catherine. She was the daughter of a certain King Lodan and Queen Manigilda. She had a vision in which the Holy Spirit appeared to her in the form of a white dove (Columba also means dove), promising her blessings and love. She decided to remain a virgin and refrain from attending the pagan temple with her parents. Shocked at her behaviour, they had Columba whipped and then thrown in prison. She escaped with the help of an angel who led her to the desert. Eventually a local king captured Columba and, admiring her beauty and grace, offered to marry her to his son, so that they might rule together after his death. Columba declined the offer and so was tortured on a wheel and thrown into gaol once more. Again, she escaped with the help of an angel and fled to the coast where she boarded the first available ship. This took her to Trevelgvy (Trevelgue Head) in Cornwall, but her prospective father-in-law caught up with her at Ruthwas (Ruthvoes) and chopped off her head! She was buried at nearby St. Columb Major. It is not clear from where Columba is supposed to have originated, or how far she travelled to Cornwall. The name is Irish, but was popular in Scotland through the works of St. Columba of Iona. He, of course, was a man, however, and Baring-Gould suggests that the Cornish saint was really the Irishman, St. Columba of Ter-da-glas. There is no evidence for this. Her father Lodan probably represents King Lleuddun alias Lot Luwddoc of Gododdin, and Manigilda, a corrupt anglicized version of his wife in Arthurian romance, Queen Morgause. Columba's feast day is variously given due to confusion with similarly named saints. The correct date appears to be 11th November.